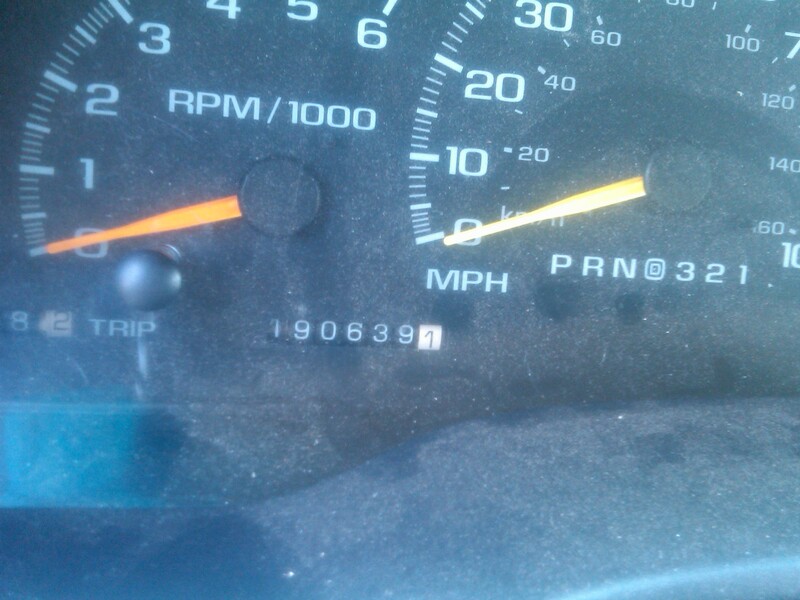 I’ve started the countdown for my clunker (AKA The Green Hornet) to reach 200,000 miles traveled. You can see a picture of this beautiful piece of work HERE. In this series, I will be sharing some of my favorite features of The Green Hornet as well some favorite moments. 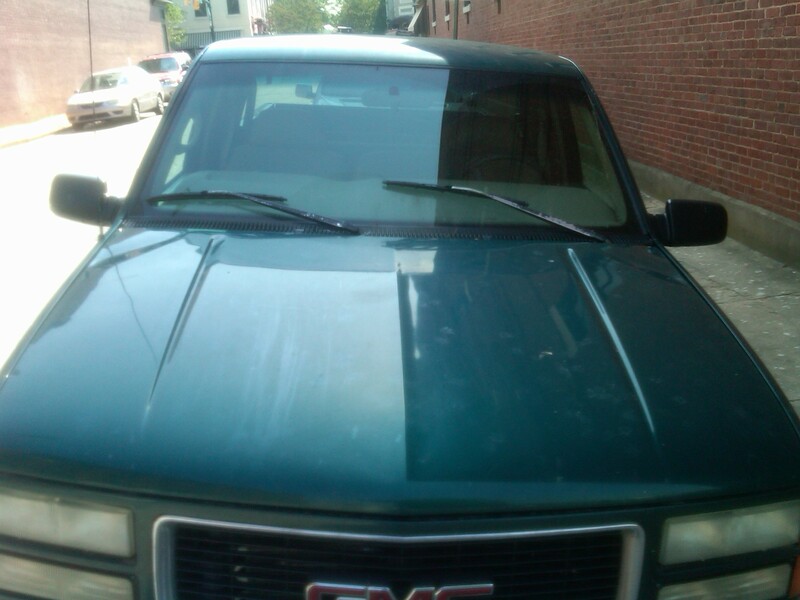 I purchased this vehicle from one of my brothers, and he had purchased The Green Hornet (TGH) brand new. In the year 2000, I had traveled all the way to Canada for a fishing trip in this vehicle and really liked how it performed. I told him that if he ever wanted to sell it that I wanted him to call me first. In 2001, he was ready to sell, and I was ready to buy (I bought with debt – remember I was making BROKE-type decisions back then). About a year after purchasing TGH, I was traveling north for our 2002 Canada fishing trip. When I arrived outside of Asheville, NC, I met the familiar bottleneck of traffic where I-40 and I-26 intersect. As TGH moved slowly through the stop-and-go traffic, the automatic transmission would SLAM! into 2nd gear from 1st gear. I’m not talking about shifting “kind-of” rough, I mean it literally lurched the vehicle forward. It was the JERK! moment. It is a familiar situation for many. I owed a lot on the vehicle, had zero savings, and had a lot of miles to go. I nervously continued on the trip and left it behind at a car repair place in Indiana while I went ahead with the fishing trip. The end result of this stressful moment? The auto repair mechanic told me to drive it until it totally broke. I did, and would you believe that the truck went another SEVEN YEARS before the transmission finally gave out – shifting hard all of the way to the end? Yet another special moment I have shared with TGH. On to 200,000 miles! I was driving home from the crusade at NewSpring Church and as I passed the beautiful funeral home on the left, my truck decided to stop running. I said, “Uh Oh”, and quickly steered the truck into the parking lot of the funeral home – not an easy task when the power steering is not powered – and discovered an AMAZING fact: trucks run better when they have fuel in their tanks! The Green Hornet was out of gas! How was this possible? Well, the gas gauge is broken. It stays buried right at “E” all of time. This means that in order for me to track when to fill up the tank again, I have to reset the “trip meter”. My bride had to drop what she was doing to come rescue me with the lawnmower gas. I’m so grateful that I did not veer into the funeral home into the line-up to head to the graveyard! ALSO: I’m driving 689 miles one way in The Green Hornet today. Get FIRED UP! We had just purchased our current home back in early 2007, and we were fixing up and updating some of the 30-year old features of our home. I drove The Green Hornet through the fence gate that enters into the back yard to bring materials around to the back of the house. It was early in the morning and the dew was still on the grass. It was also slightly uphill into the back yard. The truck needed a little “extra” help to get through the fence, so I stepped on the gas pedal. The rear tires swung to the right, caught, and then jumped through the fence. As I jumped out of the truck, the look on my wife’s face was frightening. She was staring at me with an “I can’t believe I just watched that happen!” look. 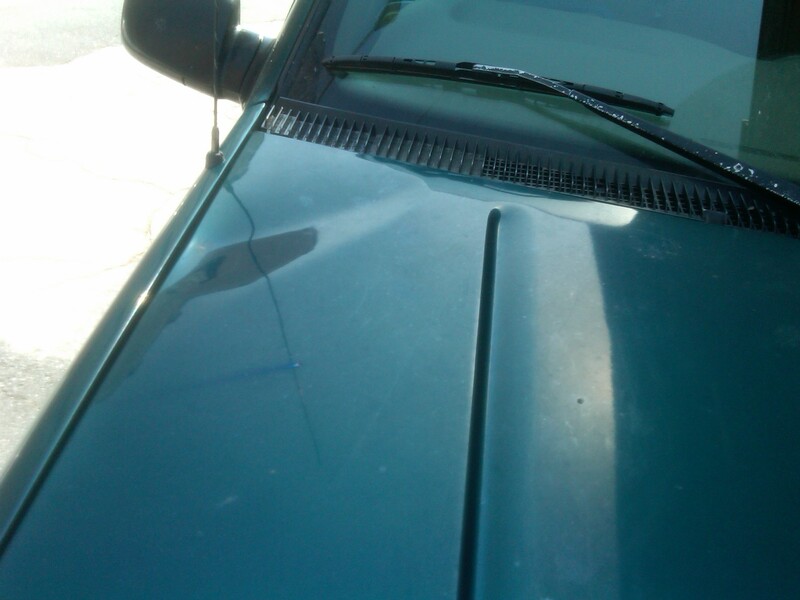 With dread, I walked around the truck and viewed the newest feature of The Green Hornet – a NASCAR Racing Stripe. It was just like I had hit the wall of Darlington at 180 mph. A picture for your viewing pleasure is below. Countdown to 200,000 miles – 8,880 to go! 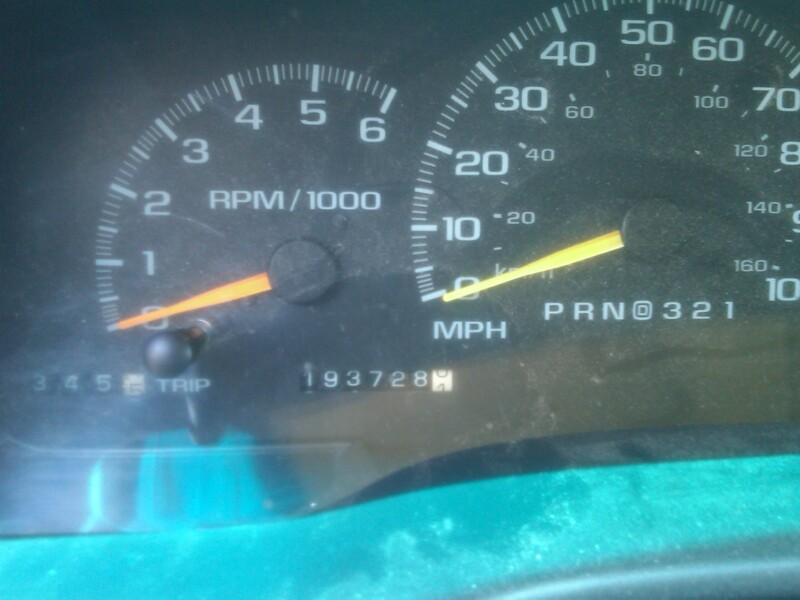 I’ve started the countdown for my clunker (AKA “The Green Hornet”) to reach 200,000 miles traveled. You can see a picture of this beautiful piece of work HERE. In this series, I will be sharing some of my “favorite” features of The Green Hornet as well some “favorite moments”. I was driving TGH (The Green Hornet) along a nice road in my fair hometown of Anderson. This road had a speed limit of 45 mph. As I was traveling along at the speed limit, I hit a mild bump and THE HOOD flew up! I’m not talking about popping up three inches and catching the safety. I’m talking COMPLETE BLINDNESS – the hood completely blocked my view!!! In town. On a busy road. Oh – and the road had curves and I was on one of them. Now, this is a special moment for anyone, but the fact that I got to share it with TGH made it extra special. God alone kept me from being in a huge accident that day, and all TGH has to show for it are two supremely beautiful large dents in the hood. You can see them in high-res by clicking the photo below. Have YOU ever had a moment like this with your “special” vehicle? 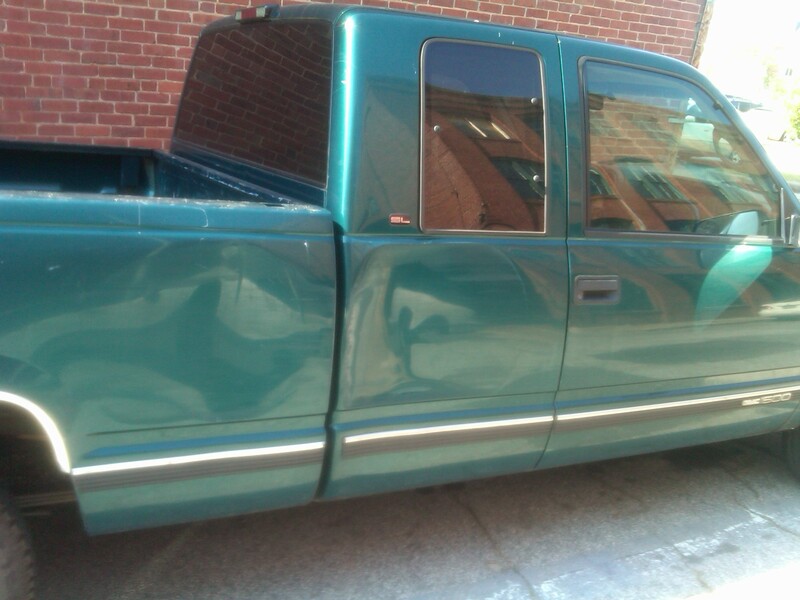 Many of you may not know this, but I drive a beat-up old farm truck. I grew up on a farm, and this 1997 GMC Sierra makes me think of home. Plus, I can throw junk in the back and haul stuff around. 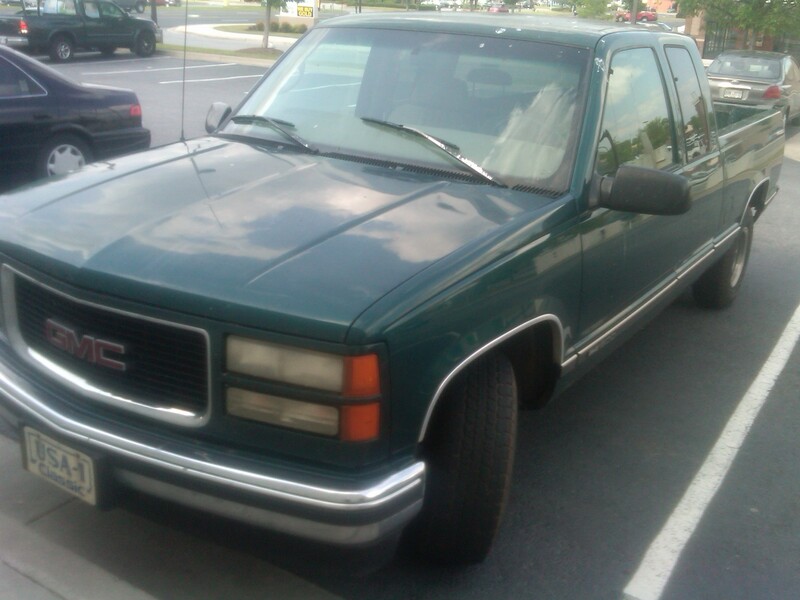 Anyway, this beauty (which I affectionately call “The Green Hornet”) is approaching 200,000 miles. My auto mechanic recently told me that she needed to be placed in hospice care, but I have determined that she is still fit to drive. I really believe that she can go to 200,000 miles. So … that means that I am going to write a series of posts as The Green Hornet approaches the 200,000 mile milestone. PART ONE Why would anyone keep driving this junker? This is a fair and legitimate question. After all the gas gauge is broken, there are several dents, and there is a slow oil leak. The primary reason I’m still driving this vehicle is because there is tremendous financial benefit to fully harvesting the value of PAID-FOR assets. It is true, however, that there is a point that an asset becomes a liability. At this point, The Green Hornet is not a liability (don’t ask my team about their thoughts, however!). 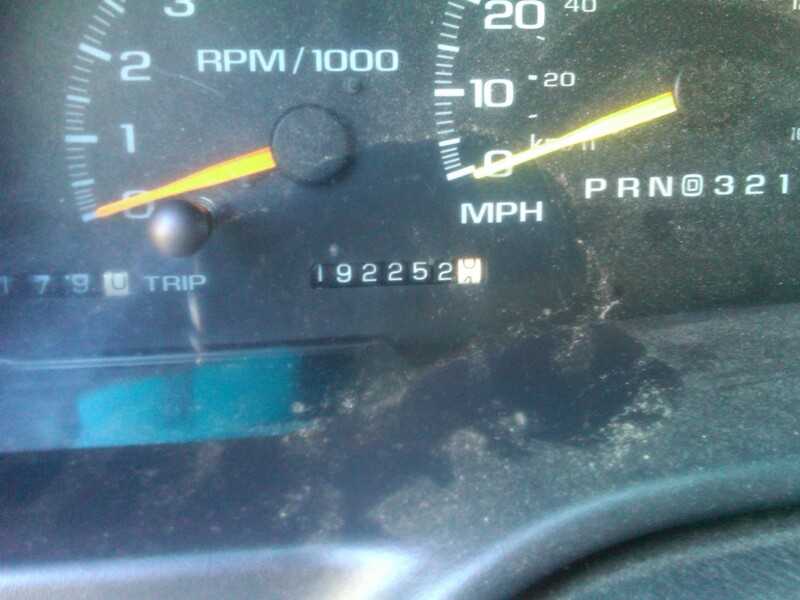 Once The Green Hornet achieves the 200,000 mile marker, she will most likely be put out to pasture.